I didn’t set any goals with relation to perfume last year, but there were a few things I never got around to in 2012 that I’d like to try and accomplish in 2013 with relation to my New Years Resolutions. 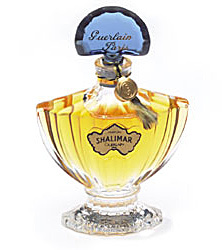 1) Get a hold of a vintage Guerlain Shalimar. I’ve wanted one for the longest time. I especially think the bottle is beautiful and I’ve put it off long enough. 2) Try more Aftelier fragrances. I loved the few I did try, but I haven’t been anywhere near close to the full range. 3) Try more from the Histoires de Parfums line. I know it’s a gimmick, but I love the gimmick and I liked what I already tried. 4) Revisit Soivohle. It’s been too long since I had anything from this house. 5) Get back into the habit of wearing something every day. I’ve been somewhat slacking this past year, sometimes going days without trying any scent or wearing any scent. I always felt like it was a wasted opportunity on the days I went without. 6) Visit the Guerlain boutique and see what shiny new things they have there. Those should be easy enough to do. In truth, my News Years Resolutions list is mighty long for 2013 so in addition to the six above, I’ve got quite a lot of work to do. In the mean time, we’ll back to a regular schedule next week. This entry was posted in All, articles, editorial and tagged editorial. Bookmark the permalink. The Guerlain resolution is a good one. If I can’t do any of the others, I want to do that one at least! No perfume-related resolutions for me this year, I’ll play it by ear.